For those working a double shift waiting tables or tending bar this weekend, the dream customer might just be a Republican, or a boomer, or a Northeastern guy, or all of the above. According to a new poll published by CreditsCard.com, it's these types of people who tend to leave the biggest tips. The poll, which was conducted by Princeton Survey Research Associates, asked just over 1,000 adults across the country about their tipping habits. "We asked things like, 'When dining out at a restaurant what percentage of the total bill do you leave?" explained ‎Matt Schulz, senior industry analyst at CreditCards.com, adding that the following types of consumers leave a median tip of 20 percent of the total bill: Men, Republicans, Northeasterners, baby boomers, and those who pay with either a debit or credit card. The poll found that women leave a median tip of 16 percent, while Southerners and Democrats throw down 15 percent of the bill. Young millennials (ages 18-26) leave a median tip of 16 percent of the bill, while Gen Xers leave a median of 18 percent of the bill. Does this poll indicate that Republicans are more generous than Democrats? Or that Southerners are less benevolent than people in the Northeast? And that millennials are stingy? It could seem that way at first, but the sturdier takeaway is this: People who tip food service workers more tend to be the people who have the most with which to tip. "What ties all [these groups] together is that they tend to be higher income than their counterparts," said Schulz. "This poll showed us that tipping has a lot to do with income — which makes sense because the more you have, the more you'll be able to use toward a tip." Evan Tarver, an analyst at Fit Small Business, told NBC News that while it "makes sense" that these higher income cohorts generally tip more, he wonders whether people's backgrounds may not play a more substantial role in how they tip. 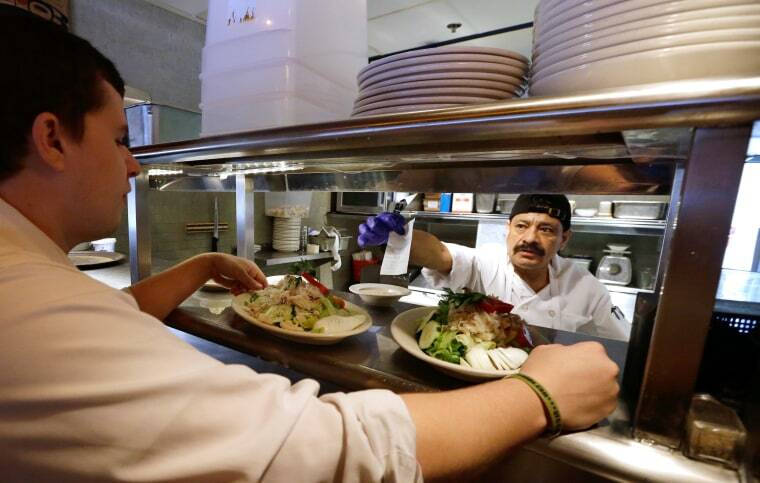 "In my personal experience, a person's job history and the specific service they're paying for is the largest dictator of tipping," said Tarver. "For example, a female with previous experience as a waitress might tip much higher than a Republican male who's never worked in the service industry before." There are also discrepancies in the poll indicating that how much you earn may influence how much you tip in a dining environment, but it has little do with what you tip at say, the hair salon. The poll found that 15 percent of people 50 and over tip their barber or hair stylist, compared with seven percent of people aged 18 to 29. Also, here, women are more likely to tip than men: 79 percent of women tip their hairstylist always or most of the time, compared with 74 percent of men. If it's not high income leading to this propensity to tip your stylist, then what is it? Bernhards Ziverts, owner and stylist, Matii Salon in New York City, suggests that it comes down to how much a customer personally values a service. Related: To Tip or Not to Tip? It's Complicated. "Generally, men are always less generous tippers [at the salon], but I think it's because they don't value beautiful hair like women do," suggested Ziverts. "Women also have higher standards so they reward you when they love how they look." While some people tip more than others, most Americans recognize the importance of tipping, at least when dining out. CreditCards.com poll showed that four out of five diners tip a median of 18 percent of the bill. People understand that though tipping is optional, it’s important. So, what then is the right amount to tip? Some restaurants include the tip in the total bill (most commonly when serving a large group), while others such as the restaurants in Danny Meyer’s Union Square Hospitality Group are eliminating tipping. Most often though, servers rely on you to leave a decent tip. Alibasic’s estimation of up to 25 percent may sound a bit steep, but it’s not far-fetched for a city like New York, where employees may make a pitifully low salary despite the high cost of living, and thus depend on tips. It’s a habit that Esteve finds Americans tend to take on the road. “Americans have a tendency to continue with this habit when they are abroad and therefore they tend to be appreciated very much by service staff worldwide,” said Esteve. While we mostly get the importance of tipping in restaurants, it’s evident that we’re not so clear on tipping etiquette in other categories. Sometimes we don’t tip (or don’t tip enough) not because we’re upset or stingy, but because we really don’t know better. For instance, you should be tipping housekeeping staff at hotels — but, according to CreditCards.com’s poll, only 27 percent of people always do; 31 percent never do. “In the U.S., the service people who help are usually given a few dollars rather than a percentage, so approximate tips would be: porter: $1 per bag; hotel courtesy shuttle drivers: $1 per bag; hotel bell staff: $1 per bag; hotel concierge: $10 upwards depending on how helpful they have been; parking valet: $2; hotel maid: $2-3 per day,” said Esteve, adding that you should also be tipping your cab drivers 10 percent or upwards of the fare, provided that the trip was comfortable and the car was clean. With on-demand services like Uber, the question of tipping becomes trickier, but now that Uber enables you to add a tip, you should do so when you feel service has been good. “Some Uber drivers offer water, candy, iPhone chargers, etc,” said Tarver of Fit Small Business. “When this is the case, I think that a tip is warranted."